Where was the first mile of highway paved? Who was the 38th President of the United States? What is the nation's most remote National Park? What was the first bottled soda pop in this country? Find the answers to these questions and many more in "M is for Mitten: A Michigan Alphabet. " Author Annie Appleford has written "M is for Mitten: A Michigan Alphabet" to acquaint children with the most important people, places and items that have helped mold Michigan into the tremendous state it is. Rich with gorgeous paintings by Michigan artist Michael Monroe, "M is for Mitten" is both educational for older children and entertaining for youngsters who will surely be dazzled by the diverse and colorful illustrations from cover to cover. Kids can climb an Evergreen tree, hop on the back of a Robin, fly with him of the Mackinac Bridge through the Upper Peninsula for a visit to Isle Royale, before going to Detroit to drink Vernor's and then to Battle Creek to eat Kellogg's cereal. They can paddle in a birch bark canoe with Native Americans in and out of our many Harbors and then head to Lansing for a visit to the Capital. 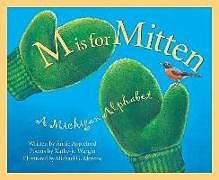 "M is for Mitten: A Michigan Alphabet" is an all expense paid trip from shore to shore through the Great Lakes State, and you won't need a map - just look at your hand!